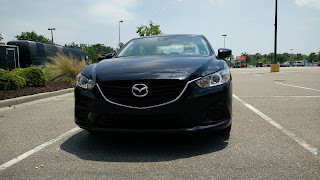 So the first surprise was that I was getting a Mazda6, but the next surprise was that I was not getting a base spec sport model, but rather the middle trim Touring model with the large 19-inch wheels and a few upgraded features. 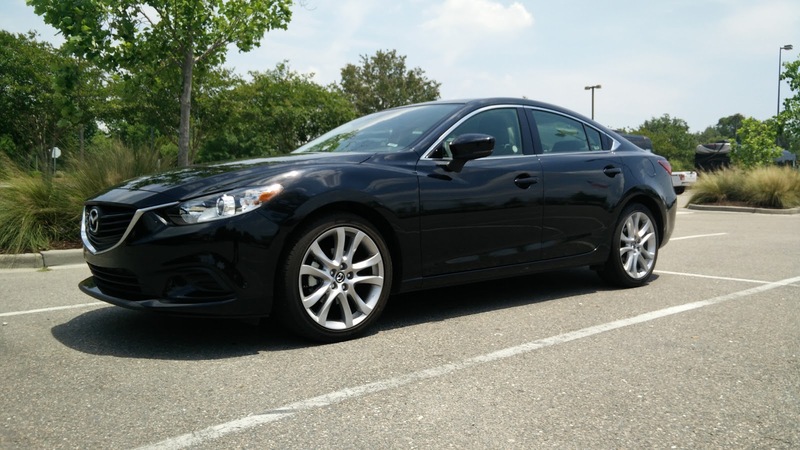 The Mazda6 is a gorgeous looking car with taut, athletic haunches and a muscular shoulders. It looks like an athlete in a tailored suit and is easily the most attractive car in its class. Every crease looks purposeful and every curve looks sculpted. The only thing that looks out of place on this car is the tiny exhaust pipes poking out of the rear fascia. For a car where every other aspect of it looks designed, the absolute lack of design around the exhaust is actually a touch baffling. But then again, maybe it is a good thing since the performance would never be able to live up to the expectations of the design. Inside, Mazda has taken a major step in improving the interior since I first drove one of these when they first came out. The revised interior design feels modern and approachable, almost downright Audi-esque. The infotainment screen perched on top of the center stack is both a touchscreen and can be driven by the controller between the seats while the simple HVAC controls mean no fumbling about with capacitive touch or other silliness to get your temperature just right. Comfort is excellent as the seats are well sculpted with deep bolsters that kept me firmly planted in the seat, much more so than just about every competitor I have driven. 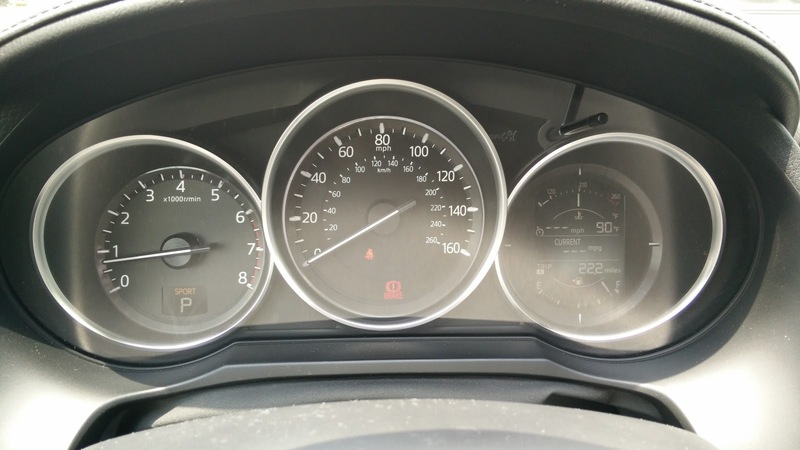 The instrument cluster is simple and seems to value minimalism over trendiness, so it lacks all of the fancy gadgets that might be available from its competition but offers a clean and easily legible set of dials for the driver. Overall, the cabin feels sharp and well executed, even if the material quality of some pieces could stand to be a bit softer. Of course, where it counts, Mazda has chosen nicely stitched leatherette and other expensive looking materials to make the driver feel like they are piloting something special. A tap of the high mounted start button and the Mazda's Skyactiv four-cylinder grumbles to life. This direct injected and high compression four-pot is the only engine option available on this car and, this being a rental, is mated to a six speed automatic transmission. Upon ignition, I wish Mazda would put a little more effort into their exhaust and engine sounds. The motor is quiet at idle, but under load, the induction noise is borderline awful and there is barely any exhaust sound. Revving the car up just produces a lot of tinny sounding sucking noise and a bit of buzzing from the exhaust. I've heard elementary school students on recorders that sounded more melodic. For a company that can make a tiny four-cylinder sound decent in the Miata, I expected better from Mazda. At least dynamically, the Mazda6 redeems itself handily. There is a reason this car is the darling of automotive journalists. 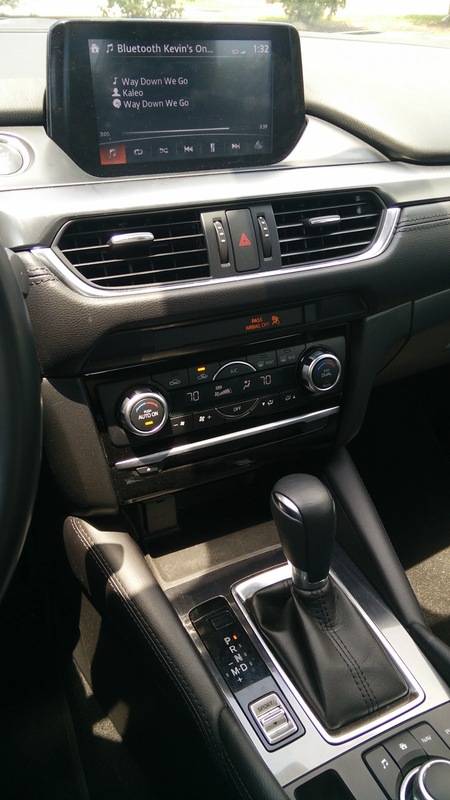 We'll start with the steering, which is surprisingly lively for a mid-size family sedan. In fact, I am willing to bet that the average family sedan buyer would find the steering a little too chatty, like that uncle at Thanksgiving who gets drunk and becomes highly inappropriate. But as a car guy, I absolutely love that I get feedback and can tell what the wheels are doing. Even our Honda Accord does not deliver this level of communication, although it is pretty good for the class. Paired with that excellent steering is a suspension that feels like it was tuned for a Miata instead of a family car. The car corners with aplomb and delivers an impressive amount of grip for a still front-heavy family car. 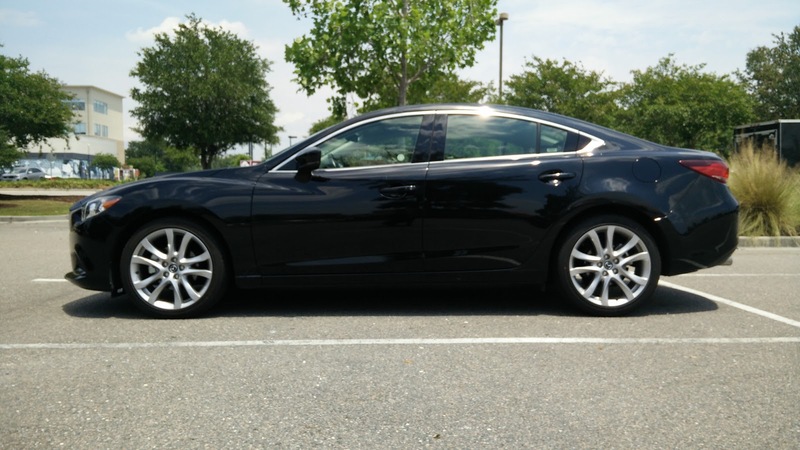 Those big 19-inch wheels mean minimal tire deflection and the stiff springs and well tuned shocks means this rather large car corners quite spryly. Set up the correct line and dive enthusiastically into a turn while letting off the gas to bring the tail around and it pulls through like a champ. Of course, outside of active suspensions, there has to be compromise for that level of performance. 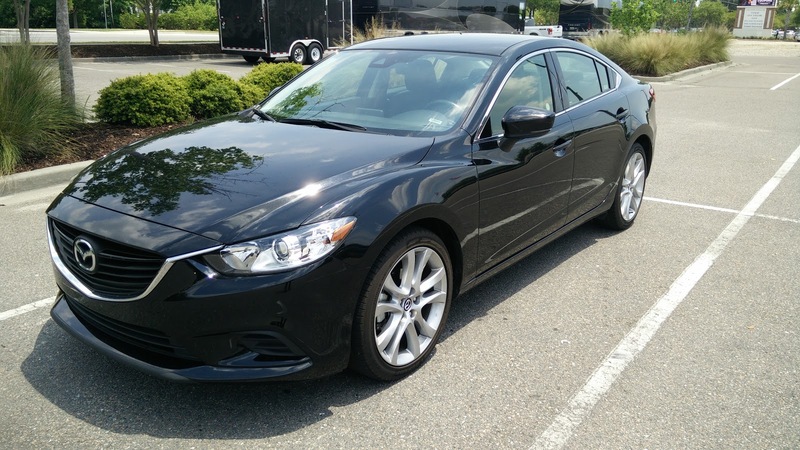 On the Mazda6, that comes in the form of a stiff ride. To be fair, it is not punishingly harsh. It clears smaller bumps easily enough and smooth roads feel great. However, stick it on something with a lot of potholes and it is going to feel a lot less comfortable than some of the competitors in its class. This ride is not unenjoyable if you like sporty cars, but for a mass market family sedan, I can see how it might get a little tiresome. But for a few days as a rental, I'll happily take all the fun I can get. 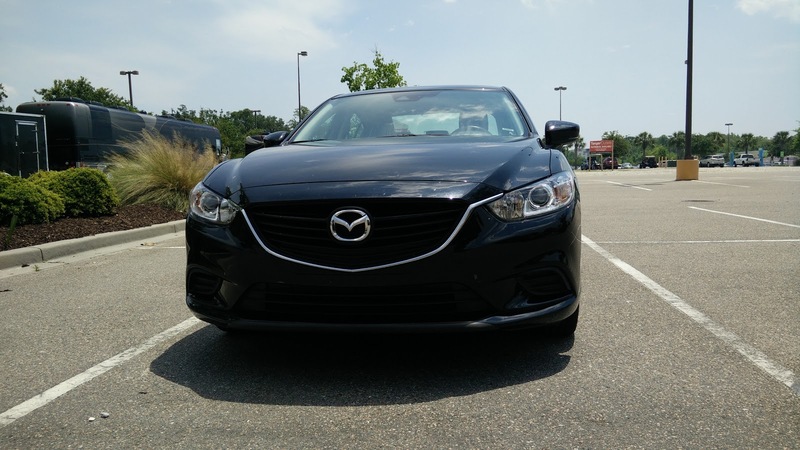 Now, as I had just come from spending a couple of days with the Sonata, it is hard not to compare the infotainment experience between the two vehicles. 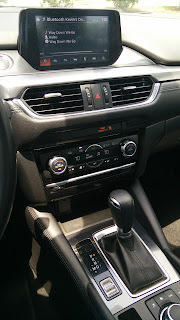 Where the Hyundai had a touchscreen only system and updated software that allows for Android Auto and Apple CarPlay compatibility, the Mazda's system is a bit older and does not support any of the newer smartphone driven tech, but is controlled by both a controller or as a touchscreen. While the lack of smartphone integration is a disappointment, the Mazda system is overall pretty easy to use. In only a matter of moments, I was able to figure out how to navigate around and make use of the basic controls without any instruction. On the one hand, all systems should be designed to be so easy to learn. On the other hand, Mazda should get with the times and update their system with smartphone integration. 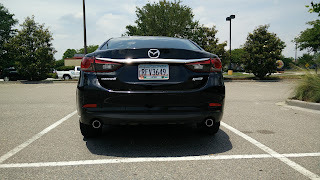 After a full day of driving the Mazda around, I was impressed with how good it is. Even though this was a mid-level trim, it felt well loaded and nicely spec'ed out. Sure it is not fitted with the fancier systems and nicer interior accouterments, but the svelte design and the strong driving dynamics made it feel like it was a much nicer car than the price tag would have foretold. 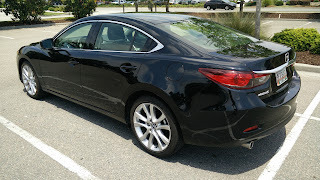 If Mazda can modernize the electronics a bit further and maybe figure out how to add the turbo-charged engine from the CX-9 to the Mazda6, it really has a shot at becoming a truly best in class car. Although even with those changes, getting people to buy them might take a whole lot more.